On July 9, 2014, Tsering Woeser and her husband were placed on house arrest for several days immediately following their return from a trip they had both taken outside of Beijing. State security officers arrived at Woeser’s home the night before to initiate the home detention, and did not give a reason for her house arrest. However, while Woeser was traveling she had received a phone call from the U.S. Embassy inviting her to a July 9 dinner, an offer which she accepted over the phone. At the time, U.S. Secretary of State John Kerry, who has given Woeser public praise before for her courageous writing and activism for Tibetan human rights, was visiting China. Beijing had previously thwarted relations between Woeser and U.S. officials when, in 2013, the U.S. State Department awarded Woeser the International Women of Courage Award, and Beijing forbade her from traveling to the U.S. to receive it. It is presumed that Woeser’s house arrest was an effort to prevent her from accepting her dinner invitation and meeting with U.S. officials. On May 28, 2010, Woeser reported on both her Twitter page and her blog that her two Skype IDs had been hacked. She explained that not only have hackers been impersonating Tibetans to contact her on Skype and trying to send her infected files, but her Skype ID had been used to contact her friends to send them infected files as well. In her blogpost, Woeser writes that she was out all day and not online on the day she was hacked, but her Skype ID was contacting her friends. In a curious coincidence, Woeser notes that it was exactly two years to the day since she wrote an open letter to the company Skype. The letter addressed Woeser’s concern over a similar attack in 2008 on her previous Skype ID and contained a statement about the relative insecurity of some of the program’s features. Award-winning Tibetan writer and poet Tsering Woeser was born in 1966 in Lhasa, Tibet Autonomous Region, where her father was a soldier in the People’s Liberation Army. As a child of the Cultural Revolution, she was raised and educated entirely in the Chinese language, and never learned to read or write in her native Tibetan. 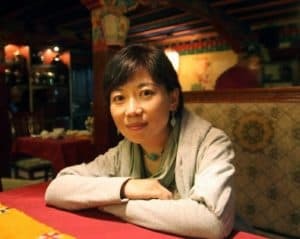 Ironically, it is this that has enabled her to be such an influential voice, and she is said to be the first Tibetan to have played the role of public intellectual in China in the sense of using modern media. She writes to both a Han (Chinese) and a Tibetan audience, and her writings are said to give public expression for the first time to the emotions and experiences of a people and a culture previously hidden from the mainstream. Woeser studied Chinese literature at the Southwest Nationalities College in Chengdu, Sichuan Province, and began her professional career as a reporter for the Ganzi Daily (Tibetan: Kardze Daily) newspaper in the Tibetan province of Kham, (present-day Sichuan Province). In March 1990, she became editor of the Lhasa-based Chinese-language literary journal Tibetan Literature. This was the start of her political awakening. She began writing poetry, and read translations of foreign books smuggled into Tibet critical of the Chinese government. Woeser’s first book, a collection of poems entitled Xizang Zai Shang (Tibet Above), was published in 1999. She soon became a highly acclaimed and prolific writer in Chinese. Through her education, journalistic training and literary expertise, Woeser became a member Tibet’s “Chinese Writers’ Group,” a small literary elite of Tibetans writing in the Chinese language. Woeser’s troubles began with her second book Xizang Biji (Notes on Tibet), a collection of short stories and prose published in Guangzhou in January 2003. The book was a best-seller in China, and was banned in September of that year for revealing opinions “harmful to the unification and solidarity of our nation.” In June 2004 she was dismissed from her position at the Tibet Autonomous Region Literature Association, and left Lhasa for Beijing in order to “follow her conscience as a writer.” She continues to write from a small Beijing apartment where she lives with her husband, writer Wang Lixiong, posting poetry and essays on Tibetan culture and the political situation on the Internet and publishing her books in Taiwan. In mainland China her books are banned, her two blogs have been shut down, she is unemployed and her movements are sometimes restricted. Yet she has become widely known as one of China’s most respected writers on Tibet. Woeser was effectively barred by Chinese authorities from leaving China for Oslo to accept the Norwegian Author’s Union’s 2007 Freedom of Expression Prize, given at their annual meeting on March 8, 2008. On March 10, after demonstrations began in Lhasa and eventually swept through Tibet, she was placed under house arrest in Beijing. She continued to post entries to her blog until it was hacked, at which time she began writing reports for Boxun.com. On May 27, 2008, Woeser’s Gmail and Skype accounts were hijacked, and her blog was once again attacked. A group called the Chinese Hongke Alliance, a well-known network of nationalistic Chinese hackers, has claimed responsibility for the attack. The group replaced content with a Chinese flag and a message advocating violence against Woeser. On August 21, 2008, Woeser was detained by police in Lhasa, where she had gone to visit family during the Olympics, and held for eight hours. She was accused of photographing the army and police presence there, which has been heavy since March. Woeser was forced to leave her mother’s home and return to Beijing on August 23. She is still facing restrictions on her movements. On July 23, Woeser launched a lawsuit against the government for preventing her from travelling abroad. In April 2010, Woeser was one of the three women honored with the 2010 Courage in Journalism Award from the International Women’s Media Foundation.